There are two major sporting events today. 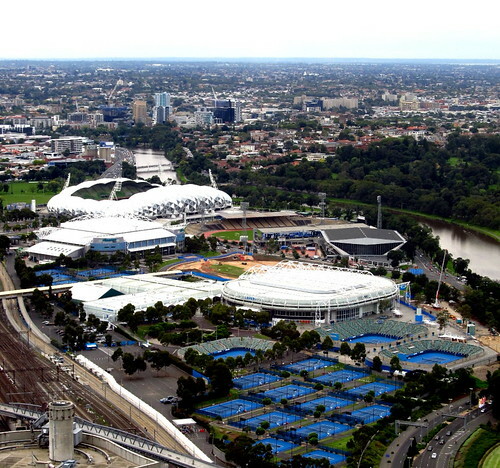 The men’s final at the Australian Open (tennis)and the Pro Bowl (football). One was epic and broke a record for the longest grand slam singles final. We watched it in awe and amazement while downing coffee and croissants. This afternoon, it’ll be time for the NFL Pro Bowl where you won’t see great play, but millions of us will watch anyway. It’s football! Len Penzo Dot Com shares 10 More Old Wives’ Tales Masquerading as Financial Rules of Thumb. How many of these do you believe? What My Son Taught Me About Life is a tear jerker by So Over Debt. Consumerism Commentary also hit my emotions with The Lonesome, Pet-Free Life. Congratulations to Fat Guy, Skinny Wallet who has Lots Of Energy, More Loose Clothing, And My Week 10 Weigh In and is 25 lbs lighter! Budgeting in the Fun Stuff was Hanging with Blogging Buddies last week and it was a fun time! She makes a mean grilled cheese sandwich. Don’t miss out on my giveaway for a Tempur-Pedic travel pillow. You’ll be helping me declutter. Really. You have More than You Think is giving away a $50 Amazon Gift Card with amazingly simple entry. Enter by midnight Tuesday. You can win an early invite to ImpluseSave at The Jenny Pincher. Enter by February 10th. NetWorthProtect has $30 cash for one lucky winner. This one ends Super Bowl Sunday. Could you use a $100 Lowe’s Gift Card? Enter at The Centsible Life by February 1st. Frugal Beautiful is giving away a $25 credit for a pet food delivery service. Enter no later than February 2nd. Do you need to do some personal finance reading? Well The Amateur Financier has a box of 10 books for one winner. Enter by January 31st. 20’s Finance is giving away two Amazon gift cards totally $75. Enter by February 22nd. Glad you liked the grilled cheese! 🙂 It was great seeing you!!! Thanks so much for the kind words! I feel great about reaching 25 lbs, but I know I have a long way to go. Wow great giveaways posted. Thank you! Thanks for mentioning my giveaway; don’t forget to leave a comment for your chance to win (at the moment, you don’t have much competition).